As the shores of the Black sea freeze over, and the winter winds send the people of Eastern Ukraine fleeing for shelter, the war being fought in their homeland has been frozen for months. The conflict in Ukraine has been raging for over four years now. Despite the initial media frenzy surrounding the conflict, it has received very little mainstream coverage in recent months. The conflict has evolved to a new stage and some politicians are claiming the Ukrainian conflict is at risk of becoming the new Korean War. As the map of Eastern Europe was being redrawn in the winter of 1992, the people of Ukraine got their first taste of independence after almost a century of subjugation. Ukraine had been under the Russian yoke for centuries; part of the Soviet Union for 80 years and the Russian Empire prior that. Russia has always fought to maintain a buffer zone of proxy states, of which Ukraine was the most important. The current war in the Donbass region (Eastern Ukraine) is a continuation of Russia fighting to keep Ukraine in its sphere of influence. The conflict in Ukraine began when protests erupted after former president Viktor Yanukovych suspended negotiations for a trade agreement with the European Union under pressure from Russian President Vladimir Putin. 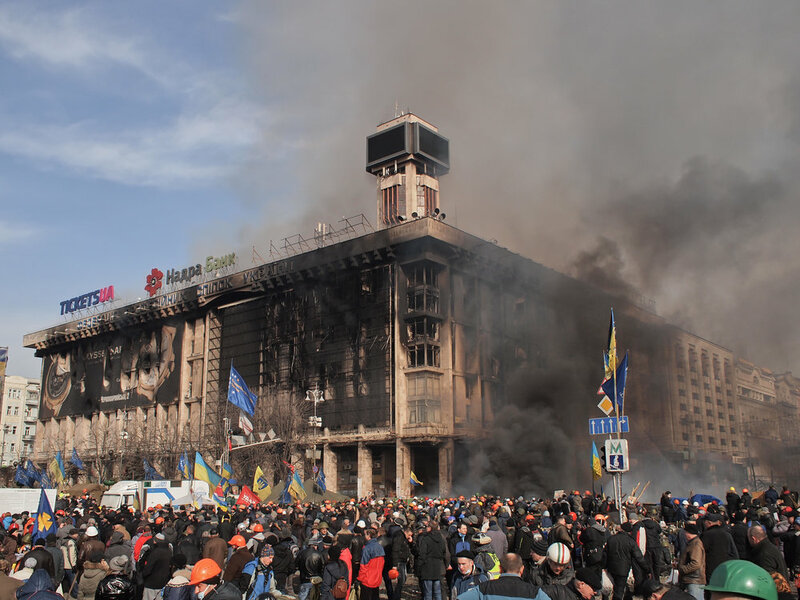 Hundreds of thousands of people filled the streets of Kiev demanding Yanukovych’s resignation. Within weeks Yanukovych had resigned and a new Ukrainian government had formed. Despite the widespread support for the protests in Kiev, there was a significant portion of the Ukrainian population who were dissatisfied with the government change. Consequently, mass counter-protests erupted in Southern and Eastern Ukraine – areas with a large number of ethnic Russians. Ukraine continued to spiral out of control when Crimea, the southernmost region of Ukraine, was taken over by pro-Russian paramilitaries. On March 14th 2014, Russia formally annexed Crimea and tension between Russia and Ukraine continued to rise. In the aftermath of the Crimean annexation, protests in the Eastern Ukrainian cities of Donetsk and Luhansk turned violent. In the spring of 2014 pro-Russian Separatists took hold of the Donbass region and proclaimed the independence of the Donetsk People’s Republic and the Luhansk People’s Republic. In the late summer of 2014 when it looked as if the Ukrainian government would crush the rebellion, a Russian “humanitarian envoy” was sent to the separatists full of artillery, weapons and allegedly Russian military personnel. With Russian support, the separatist movement was able to gain the upper hand in the war and take back much of the territory previously lost. For months the war waged on with the separatist forces slowly pushing the Ukrainian government out of Donbass. In September of 2014 the Minsk protocol was signed by Ukraine, Russia and both the Donetsk and Lugansk People’s Republic. In the agreement all sides agreed to halt all fighting to work towards a permanent solution to the conflict. However, the fighting resumed within a few months with both sides violating the truce. Since the first Minsk deal there have been over 10 attempted peace deals, all of which have failed. Today the fighting between the two sides has significantly died down. With the separatist forces successfully capturing the town of Debaltseve and the Donetsk airport in 2015, the war has turned into a stalemate. On December 23rd, 2017 another truce was signed, however violation of the truce occurs daily, with both sides accusing the other of firing the first shot. Since the separatist victory at Debaltseve, the pro-Russian movement has been unable to launch successful offensives. The same can be said for the Ukrainian government, every counter-offensive launched has been met with failure. In recent months the US has agreed to supply the Ukrainian government with military weapons and supplies. Despite their best efforts, the Ukrainians have been unable to achieve any meaningful victories against the rebels. With the separatists being backed by the Russian Federation for years, and the Ukrainian government being backed by the United States, many are wondering why the conflict is still in a stalemate. Why has neither side launched a massive counter offensive? If the separatists are strongly backed by the Russians, why have they not steam rolled the Ukrainians? Why has the influx of American supplies not been able to help the Ukrainians push back? All of these questions can be summarized into one question: why is the conflict in its current “frozen” state? In past centuries, Imperial wars were common. Mightier nations coerced weaker ones if it were of benefit. With the Ukrainian conflict, we see how warfare has evolved and how projecting military force on other nations is almost never advantageous for powerful states: The annexation of Crimea was a financial disaster for Russia. The Western powers placed tough sanctions on Russia, resulting in theRussian ruble falling to an all-time low and the economy teetered on complete collapse. Russia’s financial misfortunes are an example of the changes in perceptions that the international community has towards imperialist actions today. While the Russian nationalist spirit may support the separatists, investors do not. Peace is good for the global economy. A full-scale war in Ukraine is not a viable path to prosperity for Russia, hence why Russia has not thrown their full support behind the separatists. Every time the conflict escalates, investors continue to lose confidence in the Russian economy. The Ukrainian government is aware that its chances of defeating the Russian military are slim at best. While the Russian Federation is no longer the great power it was as the Soviet Union, Russia still maintains a military that is too large and too well equipped for the Ukrainians to defeat in an open conflict. This explains why, despite Ukraine’s continued efforts of pushing back the separatists, it constantly seeks out peace deals. Diplomacy is the Ukrainians best chance at victory. Launching a full-scale assault would almost certainly be countered, resulting in a massive loss of lives. As the conflict stands in its current “frozen” state, predicting when and if it will end remains a difficult task. Neither side is willing to withdraw from their frontline position despite both having realized that large-scale offensives are futile. The Russians do not want the separatists to back down in fear of a pro-Europe government taking control of the border state. Conversely, the Ukrainians will not pull back in fear that the separatists will attempt to retain full control of the Donetsk and Luhansk regions. The fear for all is that we are only at round four of a boxing match between the two forces duking it out in Ukraine. Dancing around the ring no one has thrown the big punch yet. It could be a while that they remain frozen in their current joist as all signs point to this fight going the distance.